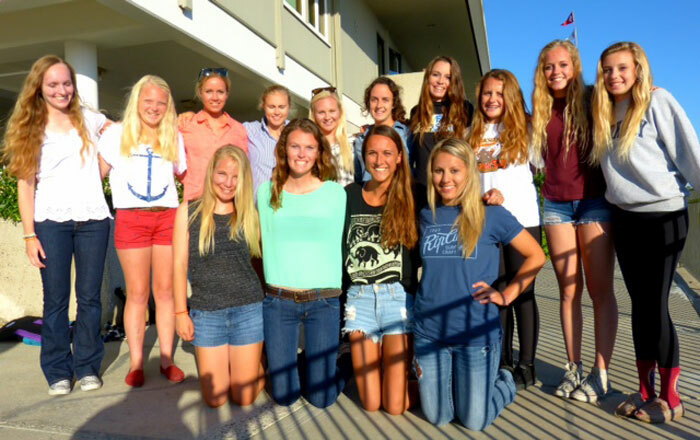 NEWPORT BEACH — A total of 78 of the nation’s top young women sailors competed June 22-27 in the U.S. Junior Women’s Doublehanded Championship for the Ida Lewis Trophy, hosted by Bahia Corinthian YC. In the end, Carolyn Smith and Bayley Davidson, representing Newport Harbor Yacht Club and Balboa Yacht Club, took top honors, tallying a 3-4-2-4 score. The race brought women sailors ages 13-18 to the club from around the country — all with aspirations of taking home the trophy. The Junior Women’s Doublehanded Championship for the Ida Lewis Trophy was last held in Newport Harbor in 2002. As race host, Bahia Corinthian YC was responsible for procuring housing for the young women and coaches, planning race management and ensuring all runs smoothly along with other race logistics. Davidson and Smith won the title by eight points, just beating contenders Cassie Obel of Marina del Rey, and Annika Garrett of Culver City. The host Bahia Corinthian YC had two sailors racing in the competition: Shannon Morris, 15, and Holly McNamee, 17. Morris, a sophomore entering Holstrom Academy in Huntington Beach this fall, has been in the Bahia Corinthian YC junior sailing program since age 6. Starting on Sabots and moving to CFJs, this was her first time racing in 420s. “We practiced for hours and hours every day to real get a feel for the boat,” Morris explained. McNamee, who lives in Colorado Springs, Colo. and has spent summers with her grandparents here since 2006, knew she had a learning curve ahead of her, since she does not have access to sailboat racing while back at home and has not raced a 420. She faced the challenge head on. McNamee was one of the many young women who flew in from various states and countries in June to compete in the race. Racers flew in from Hawaii, the U.S. Virgin Islands, Maine and Florida to contend in the championship that is now in its 18th year. For Morris and McNamee, the championship symbolized more than racing for a win. It signified a step toward sailing on larger vessels, competing on a national level and making connections with other top sailors. In addition to racing in a prestigious sailing completion, racers worked with some of the top coaches during a two-day racing clinic. U.S. Sailing’s Junior National Coach Rich Feeny; J.J. Fetter, an Olympic Silver (2000) and Bronze (1992) medalist in the Women’s 470; and Katie Pettibone, who has raced in America’s Cup and Volvo Ocean Race/Whitbread Around the Word Race; were speakers at the event. Teams trained for several hours a day, on the water and on land. For race results and more information, visit championships.ussailing.org/Youth/USJrWomensDoublehanded.html.